Carrot Hot Dogs are something that our friends have repeatedly asked if we have tried during our 30 days of vegan. To be honest, we had never heard of the carrot hot dog, so it wasn’t something we had planned to prepare. We had planned to grill some portabello mushrooms to use in place of burgers, but carrot hot dogs weren’t on our radar. After the fifth or sixth time that someone asked, we decided we needed to plan a weekend barbecue and serve carrot hot dogs. There was just one problem. I had no idea what spices were used to flavor hot dogs. I googled hot dog ingredients and learned some scary facts. I decided to check out a couple of specific brands of hot dogs, Hebrew National and Nathan’s, to learn their ingredients. After studying these lists I discovered that hot dogs contained garlic, paprika, salt, sugar, and mustard. Carrot dogs would need the same, so I compiled my ingredient list deciding to use soy sauce for the salt, and maple syrup for the sugar. I also thought about the smoky flavor that a hot dog gets on the grill and decided to add a little liquid smoke. I also remembered that when we make home made sausage, we always add some vinegar to the meat, so it made sense that carrot dogs should have some vinegar in them. It took a few tries before we came up with the cooking liquid listed in the recipe below. We opted for the pressure cooker, but these dogs could also be boiled to the desired consistency in the Carrot Hot Dogs (Pressure Cooker and Grill). If you are boiling them, you might need to double the amount of liquid to ensure that all of the carrots are able to be submerged in the marinade to evenly flavor your carrot hot dogs. We grilled up our pressure cooker carrots and served them on buns. They were a huge hit with everyone who tried them. They didn’t taste like hot dogs, but they were good. It was amazing to discover how good a grilled seasoned carrot could taste with our favorite hot dog toppings. 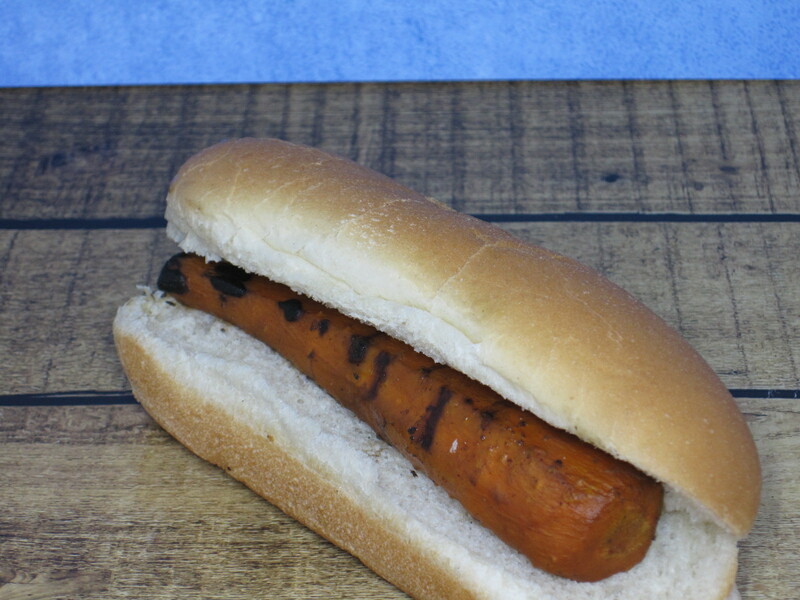 Have you ever tried a carrot in place of a hot dog? 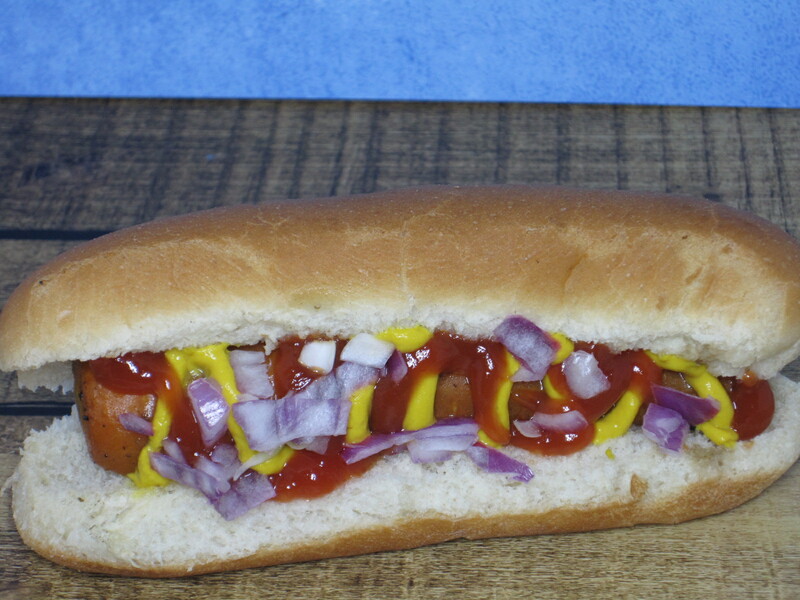 Do you think you would try our recipe for carrot hot dogs or is it just too weird? Let us know by leaving a comment below. Carrot Hot Dogs are a simple and delicious treat that allows hosts to easily serve vegan friends at backyard barbecues. Carrot dogs don't really taste like hot dogs, but they are delicious, and they are ready in about the same time it takes to heat up a regular hot dog for the carnivores. (Cook's Note's We used large carrots. If you are using thinner carrots, you may need to decrease the pressure cooker cooking time.) 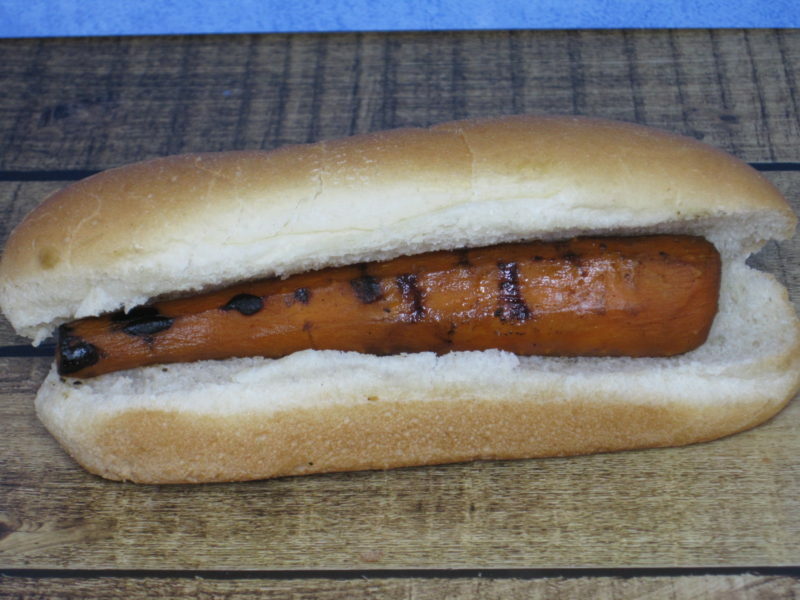 The total cost of this recipe is $3.66 or about $0.46 per carrot dog without toppings. Put everything except for the carrots into the your pressure cooker. Mix all of these ingredients well. Place carrots into the pressure cooker, trying to get as many as possible submerged in the liquid. Place lid on pressure cooker and seal. Turn on pressure cooker and set it for 5 minutes. Once it finishes cooking, manually release pressure. Remove carrot dogs from marinade and store in a covered container in the refrigerator until you are ready to grill them. Grill for 3 to 4 minutes on each side or until carrot dogs are heated through. Serve in a bun with your favorite hot dog toppings. Nutrition information is for one carrot hot dog prepared according to recipe above served on a bun without additional toppings. Martyn, that’s exactly where we were. We’d never even heard of them, but after giving them a try, we really liked them. I hope you give this a try. You’ll be pleasantly surprised. Tara, they look like hot dogs, but they don’t really taste like them. Having said that, they were surprisingly good. Even our children liked them, and they can be resistant to new things. Wow, I would have never thought that this was made from carrots. Looks just like a real hot dog! I bet this recipe is delicious and perfect for vegan/vegetarians! They do look like hot dogsn. One of our friends didn’t believe it was a carrot until she but into one. That was what we thought, too. 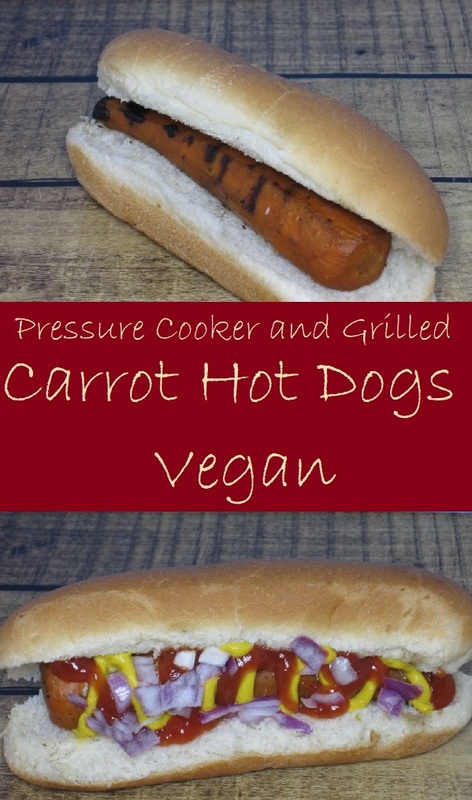 We have vegetarian friends, and this is the perfect way to allow them to have a hot dog without having to by veggie dogs at the store. I always have carrots in the fridge. Marinating the hot dogs in the pressure cooker really gets the flavor into them in a short time, and it helps get them tender. I love grilled carrots on their own, but I’ve never thought about marinating them first. Looks like a great way to still partake in a typical BBQ or cook out! Julie, I had never eaten a grilled carrot before this, but these carrot hot dogs have inspired me. We’re planning to try all sorts of grilled veggies. This is awesome! Never ever thought of carrots in hot dog! You made them look like real ones. They do resemble hot dogs, but they taste different. They are delicious in their own way. I have seen them a lot, lately, but never gave them a try. I am a vegetarian, so I don’t eat hot dogs, and the store bought veggie dogs I don’t like them at all. I might give this a try since I like carrots. Thank you! I know what you mean about veggie dogs. For me, its a texture issue that I can’t get past. I hope you give these carrot dogs a try. They’re really good. You’ve made this looks like really hot dog which is a super fun. I never heard of a carrot hot dog to be honest, but it’s surely much healthier than a real ones. Wow your photo is amazing, I couldn’t tell at first glance that it was carrot dog. I love how it is vegan and full of flavor. Michelle, thank you for the compliment about my photo. I’m really trying to get better at the photography. Several of my friends thought they were hot dogs, too. I have to give this recipe a try! I love that it is made in the pressure cooker then grilled! Kelsey, I really hope you try these. The pressure cooker really infuses the carrots with the flavor of the marinade. My daughter just starting to eat vegan recipes. I will definitely direct her to your recipe! So clever and delicious! It’s definitely a way to make sure vegans can be included in a backyard barbecue or a weiner roast over a campfire. We love this. Wow! How creative is this recipe! Perfect for the vegans and vegetarians out there. This recipe was fun to create. I was very happy with how it turned out. Even several of my non vegetarian friends liked it. Interesting! I might try a carrot hot dog, but I feel like I wouldn’t like it with the tradition toppings (mustard/ketchup). Maybe with a sweet bbq sauce/glaze and caramelized onions?